On Friday morning, we got up early (again) and in the grip of jet lag after a fantastic gig in Berry, drove to Wollongong and boarded a train to Sydney's Ultimo studios to meet the lovely Marc Fennell for a half-hour studio interview and live session on ABC Nationwide. It was tiring, we'll admit ... but worth it. In our 30 minute interview with Marc Fennell on ABC Nationwide (Sydney) where we talk about forming harmonies, the art of busking and Jaime and Marina discuss the personal stories behind the songs 'Fall in Love with Me' and 'Night Flight', which we perform live on air. "Night Flight" from the Belle Miners debut album Powerful Owl, blends beautifully into the starry night sky of The Kimberley, Australia in outback Western Australia. Soaring harmonies and delicate instrumentation pop against a sparkling violet vision of moonlit horizons and Magpie geese flying to roost over a blood-red sunset. 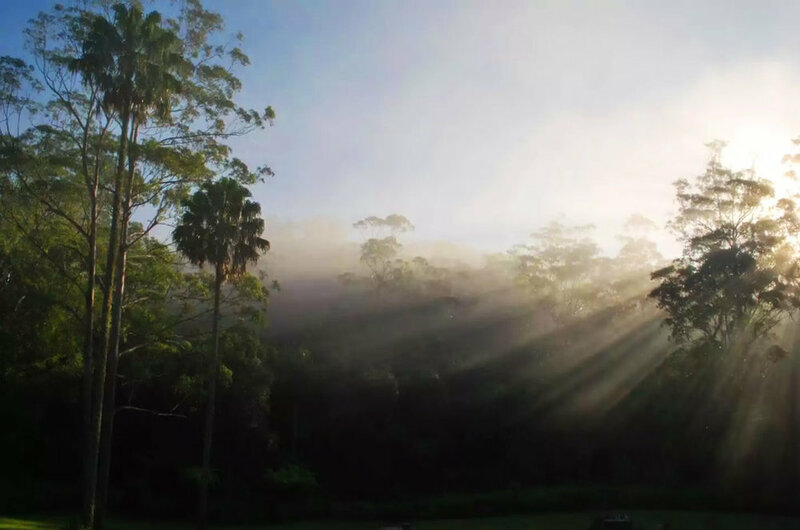 The video captures the emotion behind the song's lyrics and deep personal meaning for Jaime, as well as the strong connection Belle Miners have with Australia's birds and the freedom of its landscape. "I imagined myself as a spirit, having left my body, soaring out into the vast expanse beyond our blue-green planet, flying through the cool air like I always wished I could as a child", says Jaime. The birds were filmed by Simon Mustoe (Belle Miners Manager and founder of Wildiaries ) and Nick Hayward (whose most famous work includes the Lyrebird sequence from Attenborough's Life of Birds). The footage was originally collected over 150 days, for an Australia.com series about our most beautiful landscapes - and even includes a film about BirdLife Australia's Broome Bird Observatory, where Jaime works. Footage of the Belle Miners was shot by Darren Ho Media and Foxx Foto, with beauty and style by Erin Bradley, in Victoria, British Columbia, Canada. Jaime's reasons for thinking about death are deeply personal - she spent 11 years with a brain stem tumour deemed inoperable. Fortunately, one of the world's leading brain surgeons Dr. Charles Teo removed the tumour and Jaime is now cancer free. The song serves as a powerful and poignant reminder to never give up. Produced by Darryl LeCraw productions. It was several years ago in Berry, about two and a half hours south of Sydney, where we met and performed a small house concert at Jaime's in-laws' place. The land known as 'Boobook Mountain Cottage', is nestled among rainforest high up on Berry Mountain. One fated evening, after the sun had set and the performance was complete, a Powerful Owl flew over the stage. That night Marina wrote a song. "I didn't really know if we'd be coming back so I wrote the song to make sure I could keep the memory alive ... it was such a beautiful place" she says. "... up on Berry Mountain side, winding roads meet southern skies and wandering birds of prey in the night". That wandering bird of prey was the Powerful Owl that became the totem for the debut album. Well, thankfully we did decide to come back. And this year we aren't just playing a home-coming in Berry, we're also are playing a string of dates all across Australia. But Berry Mountain will always have a special place in our hearts and we are desperately looking forward to returning. Early bird tickets are still available until the end of this week, so make sure you head over to the website and book yours.